In a public health climate where 75% of adults in the United States are overweight or obese and 26 million have diabetes, the need for a lifestyle change is greater than it has ever been. The Food for Life: Kickstart Your Health curriculum is based on the Physician’s Committee for Responsible Medicine (PCRM)’s successful 21-Day Kickstart online program (21DayKickstart.org). The Kickstart program has helped over 200,000 people adopt a whole plant diet to reach their health goals. These classes can help you lose weight, maintain a healthy weight , or simply embrace an overall healthful diet. For some class participants, it’s the first time the idea of not restricting amounts of foods, but rather choosing the right foods, has been the guiding principle for losing weight and staying healthy. Lower cholesterol, better diabetes control, lower blood pressure, as well as improvements in energy and mood are some of the many benefits people experience on this diet. The program begins with a Kick Off and goes for 21 days, essentially treating food as medicine. During this period, most can lose 5 – 10% of body weight and experience a cholesterol drop averaging 20%, improve A1C levels, and achieve a normal blood pressure. Working with your physician is encouraged, as this program is prepared for optimal nutrition and not meant to replace medication or doctor’s advice. 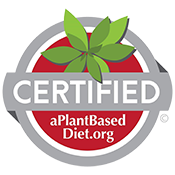 If you’re interested in losing weight, increasing energy, and learning about this life-changing way to eat, sign up for GreenFare’s 21-Day organic, whole-plant-food nutritional program. Our PCRM Kickstart removes the time obstacle to your success. Stop by or call GreenFare to register 1 week prior to program start date! Daily Lunch and Dinner Entrées: For 21 days you will receive lunch and dinner entrées: freshly prepared, organic delicious meals conveniently packaged to heat up at home or work. (4 Dinners at GreenFare during classes): for a total of 43 meals! 2 Blood Tests*: An optional lipid profile will be provided for blood testing at local medical lab at the start and finish of the program for cholesterol levels. 1 Lifestyle Assessment: Schedule at least 3 days before start of class, if desired. 2 Weigh-ins: At the start and finish of the program. 1 Shopping Trip: Discover easy and affordable ways to sustain your new healthy eating habits with the guidance of your instructor. 4 Healthy Eating Classes: Learn some of our favorite methods for cooking delicious plant based meals.